TLDR Up Front: Evaluate your news sources by applying the Eurocentric bedchel test! In addition to the Eurocentric lead role upon which the news story will (of course!) primarily focus on, are there at least two named indigenous influential actors presented with their own agency, motivations and conflicts/disputes that are not tied to the Eurocentric lead role to give context? 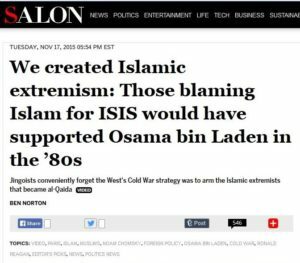 Examining Salon’s recent article proclaiming “We created Islamic extremism!” shows it fails this test badly. Full Context in the Back: The article from Salon from a few days ago provides a good example of how to stupendously fail the Eurocentric bedchel test. 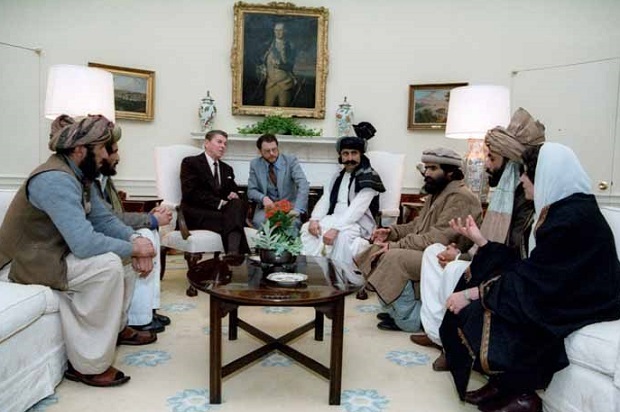 (1) In this case what purports to be a history of Al-Queda manages to not only manipulate photos to create the image of ‘scary’ Afghan militants meeting with Reagan, completely miss half of the Al-Queda origin story, overlook seminal events in the development of salifi takfirism it quotes only one non-Eurocentric source; and that’s the Pakistani born Eqbal Ahmed who moved to the United States in the 1960. And yet this article has become highly shared amongst progressive liberals who would swear they have ‘moved beyond’ a solely Eurocentric bias in their reading. I’m not sure if Norton and Salon just did a google image search of “scary looking Afghans meeting with Reagan” but they’re basically taking in one case a “good guy” who fought against the Taliban for all his life and ended up being killed by them and in another local villagers and put them in a piece about the rise of Islamic extremism without even bothering to learn their names or stories. Way to go Salon! Turbans? Brown skin? Must be Taliban. What is so brain-poundingly awful about this article is that it purports to be a history how “we created Islamic extremism” and even taking the conceit that they focus solely on Al-Queda somehow completely misses that Al-Queda’s ‘origins story’ lies in the merger of several different groups. Yes there is Osama bin Laden the Saudi financier in Afghanistan; but there is also Ahrmin al-Zawhari of the Egyptian Islamic Jihad (EIJ). Al-Zawhari’s name should be familiar to Norton because he was the number #2 of AQ throughout the period of time Norton is writing about and took over leadership of AQ after Osama bin Laden was killed. If we follow the pathway of al-Zawhari and the EIJ it traces back to the assassination of Sadat in Egypt in 1981, and the massive response by Sadat’s successor Mubarak to crack down on Islamic radicals in Egypt. (4) Now follow that path forward because Mubarak should be a familiar name as he sustained and expanded Sadat’s “deep state” security apparatus in Egypt which persisted until the Arab Spring deposed him. And although the deep state temporarily lost power when the Muslim Brotherhood won the first elections, Morsi’s abysmal handling of parliament and constitutional authorities opened the door for a military coup that restored the Sadat/Mubarak deep-state to power. The military coup unleashing a torrent of bloodshed, extrajudicial killings and imprisonments. And when you massacre people and imprison them they tend to radicalize – which is exactly what happened. Armed Bedouins in the Sinai region with a legacy of grievances against central Cairo government were now hyper-charged with new members and support. This launched the Sinai insurgency with various salafist takfiri groups such as the Ansar Bait al-Maqdis that gradually coalesced into a single group which….wait for it….declared baayt to ISIS last year and just brought down a Russian plane two weeks ago. And yet we created salafi takfirism? The Sadat assassination, the reaction by the deep-state, the Arab Spring, the deposing of Morsi, and the Sina insurgency reaction – all local actors acting with local agency to local conditions and grievances based on a history going back decades (and longer if we really want to get into it) all eurocentrically washed away in a “blame Reagan” simplification. But putting aside the entire half of Al-Queda that arises from Egypt surely the story about the wealthy Saudi coming over to Afghanistan tabula-rosa awaiting to be radicalized by the CIA is true? Except that it ignores Saudi history and OBL’s context within it that precedes the Afghan war. Let’s look at just one key event. In 1979 religious extremists attempted a coup against the King of Saudi Arabia by seizing the Grand Mosque of Mecca, taking hundreds of hostages and resulting in a two-week siege that turned into a bloody battle. To put this in perspective we are reacting now to the attacks in Paris that killed 120 and wounded about three times that. Imagine then the reaction in a country half the size in population of France reacting to the death of nearly 400 pilgrims and military killed and another 1000 injured that occurred in a site just as holy and noteworthy to Christians as the Vatican is. This act rocked the Islamic world – a “where were you when JFK was shot” to anyone in the middle east and certainly Saudi Arabia and most certainly OBL who was 22 at the time just leaving a conservative education from a Whabbi (Salifi) university and whose family had extensive construction contracts at the Grand Mosque at the time of the attack. Now – remember – these two events; the Grand Mosque seizure in 1979 and the assassination of Sadat in 1981 only happen less than two years apart. The Iranian Revolution is ALSO kicking off in 1979 and – not to forget – the Soviets did invade Afghanistan in 1979 (so Salon gets that one right). If one wanted to find the seminal origination of modern Islamic extremism in a wide variety of regions and a wide variety of forms – I’d point to 1979-1981 as the key two-year period. The ripple effects of each localized event in isolation were enormous – but when they began overlapping one another it created a reinforcing feedback loop of a global scale. This is also a key rebuttal for those trashy histories on the right that try to portray Islamic extremism as a “thousand year old” problem with Islam. No really – it’s only a few decades old and although its roots go deeper than the 1979-1981 period and the four events I listed above it is during that time that movements metastasizes and begins accelerating to what we see today. This is not to say the US and Europeans haven’t had a hand in it either prior to or after the 1979-1981 period. The world is not a series of aquariums sealed off from one another waiting for some externality to reach in and stir the water. The world is dynamic and interconnected. The US supported Mubarak and his Egyptian deep-state because they kept the peace with Israel. The US also supported the Saud monarchy because of their key role in OPEC and as a check against Iran. The colonial occupations of many countries and interventionist activities have had ripple effects in the uprising and independence movements we see in both Africa and the Middle East; the Sykes Picot lines (thought not nearly as spuriously drawn as often portrayed ) certainly split indengous people across national boundaries that made no sense and ultimately, may not be sustainable. But a proper examination of political affairs and history should have room for the voices and motivations of all actors, not just the Eurocentric ones. It’s not like the Salon article lacked the room – its several pages long and even found time for a Noam Chomsky quote at the end. And it’s not like some overworked journalist lacked the time to do it right – I wrote this in <2hours. And I’m calling out Salon because this is not the first time they have white-washed (quite literally) world history to present a Eurocentric serving of confirmation-bias to their readers: portraying Islamic countries and Muslim actors as helpless just waiting for the west to come in and muck things up for them. (7) The Muslim world was reacting to, and fighting against, salafist takfirism in a variety of forms decades before ‘the west’ became increasingly involved as takfiri exported violence spread to US and European countries. It’s an interesting history, it’s an important history, and its worth passing the bedchel Eurocentric test to get it right! The reason this is both amusing and historically blind is that the European Dark Ages follow the collapse and departure of a ‘colonial occupation’ that ‘terrorized and brutalized’ local populations – namely Rome. And to the extent that extended colonial occupation by foreign powers can set up extended periods of instability and violence after their departure from which boundaries are redrawn through conflict – Norton is kind of making their point for them.